I'm always interested to see what is coming out of the European market…especially in the realm of lighting. 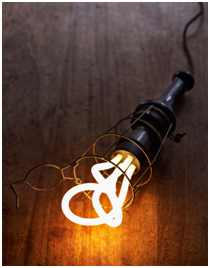 Take for example the Plumen, a wonderful reinterpretation of the standard CFL lamp. They have taken what has been the standard swirly ice cream cone shaped lamp that is now been the American industry standard for years and turn it into something rather beautiful. The glass tubing is been elongated and flows away from the socket like the plumage of a bird. No longer does the CFL have to hide behind some sort of shade material, now it can be loud and proud saying, “Here I am, take a look”. 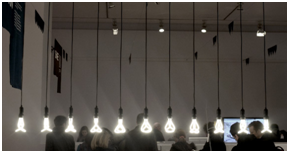 The first Plumen lamp was added to the permanent collection at MoMA (Museum of Modern Art) in New York, and the second was featured at the Victoria and Albert museum in London. How often does a light bulb make it into a museum? For a while there was only a 220 V version of lamp available for those people fortunate to be living in Europe. Now a 120 V version has been introduced for the US market. You can adopt some of your own at Hand-Eye Supply (info@handeyesupply.com), located in Portland, Oregon. I'm excited to see what lighting designers and manufacturers made do to incorporate this lamp into their designs. While the Plumen lamp by itself is pretty beautiful, the idea of suspending it within a glass cylinder or perhaps used in multiples gives me a lot of hope for the lowly CFL. It's pretty exciting for me to see something reinvented. 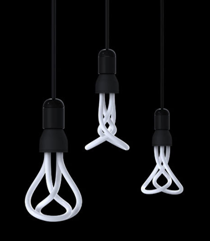 My hat is off to Samuel Wilkinson, who designed the Plumen lamp and the people at HULGER, a forward thinking London based company, who developed it and brought it to market. Whoever thought a CFL could be downright charming?